Whether you celebrate the holiday or not the FortuneJackrabbit you a bonus surprise! Simply make a deposit anytime between March 29th through April 4th, 2018, and FortuneJack will instantly DOUBLE your deposit up to 600 mBTC + 80 FREE SPINS! 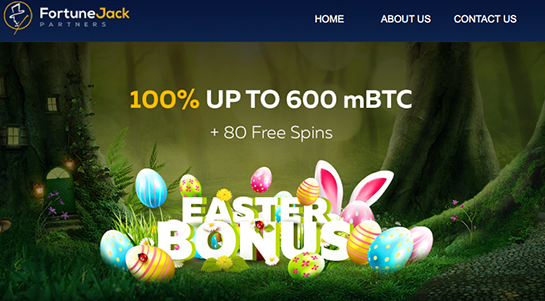 Hop to Your FortuneJack Bitcoin Easter Bonus Here! This entry was posted on Thursday, March 29th, 2018 at 6:05 pm	and is filed under Casino Promotions. You can follow any responses to this entry through the RSS 2.0 feed. Both comments and pings are currently closed.